Ocean Front Condo, 2 Schlafzimmer, 2 Bäder, (Schlafmöglichkeiten für 6), mit allen Annehmlichkeiten. Wenn Sie die Brandung, weißen pulvrigen Sand, Sonnenuntergänge, Golf Brisen und Komfort von zu Hause zu lieben - das direkt am Strand Wohnung ist für Sie! innerhalb von 40 Minuten Fahrt zum internationalen Flughafen Tampa und nur 15 Autominuten von der Clearwater / St. Flughafen Petersburg. Kostenfreier Zugang zum Fitness-Studio Nachbarschaft. This review is unwarranted and mean spirited. Without specifying how thiscondo “needs work”, it has cast a a shadow on its comfort ,modern conveniences and spectacular ocean views for an excellent price. Kitchen linens( dish towels, tablecloths, cloth napkins ) ARE available in the chest of drawers in the living room area. Since we live in this condo, we must have one closet to store personal items. There is sufficient storage and closets throughout the condo, especially for temporary rentals. The construction outside is beyond our control. Our beautiful beaches must be maintained in the slow season due to hurricanes and other issues. Please do not rent our condo again. We prefer guests who appreciate the fully- stocked, granite topped kitchen, the marble baths, the free WiFi , the pool and ocean steps away, the spectacular ocean views the covered, private parking space and the pleasant ambiance of our “ second home”. Love the view, love the area! We just recently enjoyed a wonderful stay in this very comfortable and lovely unit. 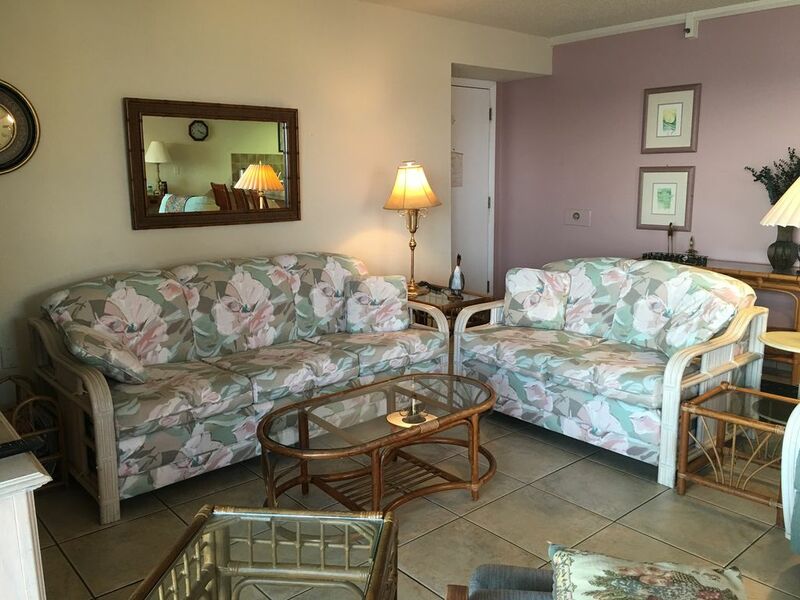 We love being able to see the Gulf waters from the unit and with two bedrooms and two baths, it is a very comfortable size whether for two or four. The kitchen is well stocked as well so if you like to do your own cooking, you'll likely find everything you need right here. We knew that Hurricane Irma did lots and lots of damage all over in Florida, but when we came in late October, we couldn't see any evidence of hurricane damage at Holiday Villas III. The office staff is very friendly and helpful and we hope to return here again next year. There is not one thing that you would need for this condo. It absolutely has everything. It is clean and well appointed. The pool is clean and warm with plenty of chairs around it. The beach is beautiful and the water is clean and beautiful. You can't miss with this great place to stay. No traffic woes here. Plenty of wonderful restaurants nearby. It is absolutely ideal. The condo is beautiful, roomy and comfortable! You won't believe the view from the balcony! Wow!! PJ's Oyster Bar (on Indian Rocks 5 min N)Great food and service! I would highly recommend staying at this condo. Great price!! We had a great time!! A very nice rental, well kept and clean. Secure and great place for kids. Office was very helpful as well.